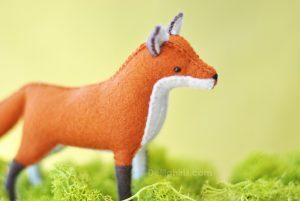 This adorable mini felt fox doll pattern is the perfect compliment to my collection of tiny animal dolls. Meet Fergus the fox! He stands only 4 inches tall and sports a dapper pair of felt cover-alls. 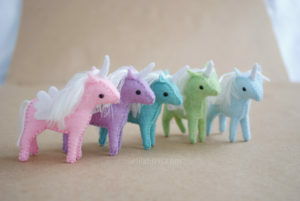 This miniature doll is quite easy to make. Perfect for a beginner to practice sewing. And these dolls make fantastic gifts! Whip up a batch of a thoughtful handmade and whimsical gifts and practice your sewing skills while you’re at it. This mini doll sewing pattern will come to you by email via a instant download link. The file itself is a digital PDF file to print your own pattern and tutorial onto standard 8 1/2 by 11″ copy paper. The fox doll is a finished height of about 4.5″ tall to the tip of the ears. The pattern and tutorial include the doll, his overalls plus a felt or cotton cloth dress pattern, and instructions to create a tiny fox doll with sewn in wire for gentle pose-ability. Fergus the fox mini doll is part of my tiny animal doll collection along with a tiny bunny doll, kitty doll, and soon to be a adorable tiny bear doll. Imagine if all of your favorite animal friends were frolicking in the forest, fields, and meadows dressed in their finest afternoon tea frocks. When all of the humans are too busy with their work and tasks to notice, our furry friends are sneaking off to gather beneath the pines by the stream running off of the lake. Fergus the fox is always busy on his farm, weeding the garden and tending to his chickens. So he is almost always dressed in his coveralls. He loves to bask in the sun while tending to his fields. But can always find a spare moment or two to whisk away for afternoon tea with his friends at the stream by the lake.